The weather is perfect right now and the fishing is just about there as well. Bait fish like scaled sardines and threadfin hearing are all over our beaches and the fish are gorging themselves on them. 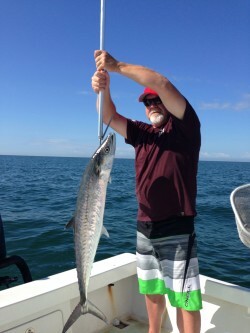 My charters are getting there fill of Spanish Mackerel and the Kings are starting to show as well. I prefer to anchor off St Pete Beach with a well full of sardines and chum heavy to bring the fish to us. No monsters yet but there have been some nice 20-25 pound king fish caught. A nice bonus has been some Triple tail in the 5-8 pound range. This is where my tower really comes in handy as I am able to spot fish on the surface when riding from spot to spot. Next post: St Pete Beach Hog Wild!